Based on popular demand for Mengku Rongshi Green Label, we now bring you Mengku Rongshi Brown Label. 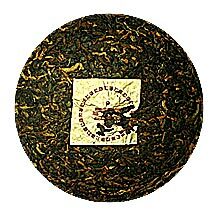 This Black Pu-erh tea cake is produced from young leaf buds and you will find golden-brown color tea leaves all over the tea cake. Its relatively smaller size (approximately 145 grams) and smooth, mellow taste make this a good choice for Pu-erh tea beginners.